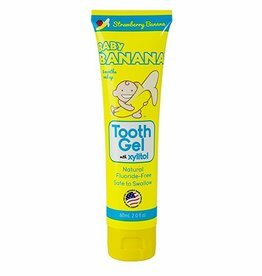 Baby Banana Brush is a FDA-patented flexible toothbrush and teether all-in-one. This ideal infant training toothbrush was invented by a mom-hygienist. The unique flexibility of the Baby Banana Brush makes it much safer than traditional infant training toothbrushes and decreases the risk of mouth injury. The brush is made of small bristles massage teeth and gums and 100% medical grade silicone, which is not only durable and safe for your baby, but also dishwasher safe for easy cleanup.